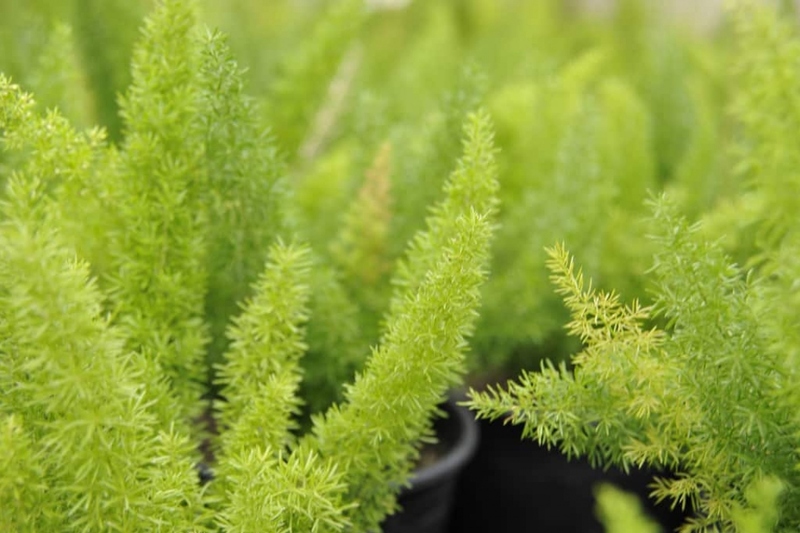 Asparagus fern (Asparagus spp. ): growing, planting, caring. Scientific name : Asparagus spp. Here, we’ll talk mostly about Asparagus setaceus, but you may encounter one of its cousins, A. densiflorus and A. aethiopicus - see below ! A. Setaceus - Asparagus fern, lace fern, climbing asparagus, or ferny asparagus - is a climbing plant in the genus Asparagus. Despite its common name, the plant is not a true fern, but has leaves that resemble one. It is native to Southern Africa, and is grown elsewhere as an ornamental plant. It has become an invasive species in some locations where it has been introduced. Quick note about two of its cousins : Asparagus densiflorus - also called asparagus fern, plume asparagus, foxtail fern - is an evergreen perennial plant, closely related to the vegetable asparagus, and native to southern Africa from Mozambique to South Africa. As it cannot tolerate frost, in temperate regions it is usually grown indoors or under glass. Numerous cultivars have been developed, of which the compact form 'Myersii' has gained the Royal Horticultural Society's Award of Garden Merit. Its dense 50 cm plumes of foliage are especially valued in flower arranging. Asparagus aethiopicus, Sprenger's asparagus, a cousin, also used as an ornamental plant but considered an invasive weed in many locations, has been confused with A. densiflorus, now regarded as a separate species.